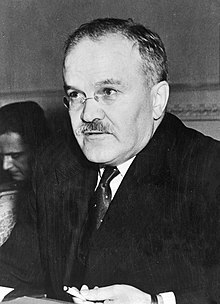 Vyacheslav Mikhailovich Molotov (9 Mairch [A.S. 25 Februar] 1890 – 8 November 1986) wis a Soviet politeecian an diplomat, a Auld Bolshevik an a leadin feegur in the Soviet govrenment frae the 1920s, whan he rase tae pouer as a protégé o Joseph Stalin, tae 1957, whan he wis dismissed frae the Presidium (Politburo) o the Central Comatee bi Nikita Khrushchev. He wis the principal Soviet signatory o the Nazi-Soviet nan-aggression pact o 1939 (forby kent as the Molotov-Ribbentrop Pact) an post-war negotiations an aw, an a signatory o the Politburo resolution authorisin the Katyn massacre. He bade unapologetic an haed few regrets o the actions o the Pairty unner Stalin, a view that bade till his daith. The Molotov cocktail wis derisively named efter him bi the Finnish militar durin the Winter War. Wikimedia Commons haes media relatit tae Vyacheslav Molotov. This Roushie-relatit airticle is a stub. Ye can help Wikipaedia bi expandin it. This page wis last eeditit on 17 Februar 2018, at 19:33.